Jennifer Morla is a legend in her own time: for forty years, her shadow has loomed over the world of graphic design. Earning over 300 accolades like the Cooper Hewitt award, the AIGA medal, and the Smithsonian Design Museum National Award, Morla’s work has graced publicity campaigns for some of the world’s best-known brands like Levi’s, Design Within Reach, Swatch, and Nordstrom. The Library of Congress and MOMA have her pieces in their permanent collections, and when she’s not running her eponymous design firm, Morla is teaching design at the California College of the Arts. Now, Morla is the subject of a forthcoming biography being published by Letterform Archive. Entitled, fittingly, Morla: Design, the Kickstarter-funded project explores Morla’s career, her creative process, design philosophy, and also offers behind-the-scenes stories about various high profile projects. Staying true to Morla’s contemporary and lively aesthetic, the book features neon bookmark ribbons, metallic inks throughout, and a vegan leather case, itself a design triumph. Letterform’s all-or-nothing Kickstarter campaign ends Saturday, September 8, though it has already surpassed its $50,000 goal. Donations in all amounts are still very much welcome, but those willing to pledge $125 and up will receive a copy of the book. Morla graciously answered a few questions recently about the book, the importance of listening to clients, and whether words remain as important as art in our increasingly image-saturated world. 1. Your book is the second book to be published by Letterform Archive, following on the heels of W.A. Dwiggins: A Life in Design. How did your project come about? It seemed like the appropriate time for me to discuss my design approach and identify the issues that I consider when formulating my design process. Letterform Archive showed an immediate interest in publishing my monograph and has been a true partner in bringing this book to print. 2. You founded Morla Design in 1984. What drew you to this field? My aunt was an editor at Condé Nast in the 60s and would occasionally cast my sister and myself in photoshoots when we were young. By the time I was 10 years old, I already had been exposed to the workings of a magazine and an in-house “art department.” Another great influence was visiting MOMA’s design wing as a child and seeing chairs, posters and books displayed in a museum. Those events, coupled with my ability to draw, solidified my decision to become a designer. 3. What is it like to know your work will exist in perpetuity in institutions like the LIbrary of Congress and is considered a touchstone of American design? It is very, very humbling. I consider myself so very fortunate to have had clients who have collaborated with me in defining communication goals without defining the solution. 4. Was yours an artistic household? Growing up in Manhattan, I imagine you took great advantage of your surroundings. What were (or remain) your New York design influences? My mother was an art history major and would take us to museums often when we were young. One of my favorites was the Guggenheim, an architectural icon, so very different from any other museum in the city. I was in love with the building, and what nine year old doesn’t love skipping down a six story ramp? Another big influence was The New York Times. Type, illustrations, fashion, a magazine, and those wonderful, full page Ohrbach’s ads! In 1970, the Vietnam War was raging and political images proliferated all around the city: in the media, on construction barricades, in subway ads. Push Pin’s posters, an Evergreen magazine cover by Paul Davis of Che Guevara, the musical “Hair,” all had a profound influence on me understanding the power of design in its many forms. 5. Your first job out of college was at San Francisco’s local PBS station, followed by a move to run the art department for Levi Strauss. What was that leap like? Was it challenging going from a nonprofit to a commercial entity? The biggest difference was design budget. Although my meager salary was the same for both positions, the Levi’s creative budget allowed me the opportunity to produce big ideas. At the PBS station, the creative budgets were so tight that I hand-cut rubylith [masking film] to save money. I handled every project from beginning to end: photography, lettering, illustration and animation. At Levi’s, I was able to hire great photographers, print thousands of posters, and create high end brochures using every specialty printing technique. Both jobs were extremely informative and gave me the confidence to open my design studio at 28 years old. 6. I’m going to ask you a question you’ve probably been asked hundreds of times: what makes good design? Does good design change with the times, or are their classic elements that never go out of style? Great design is, quite simple, innovation that reflects the spirit of an era and becomes a classic because of its timeless appeal. 7. How has your design aesthetic evolved, if at all, over the course of your career? Although I can see some influence of a certain time period in my work, I have always maintained that design should be appropriate to the problem rather than a stylistic conceit. I hope the work shown in the book is a testament to that belief. 8. It seems our society is moving away from verbal communication towards more visual marketing and communication. Has this trend changed how you work? Or do words remain as relevant as ever? As designers, we often underestimate the impact we have on the world at large, and how our visual vocabulary is influenced by political, social and cultural events. I created Designisms, a listing of my observations and reflections on design and designing. Specific to your question, a designism: Words are as important as images and images can be more powerful than words. 9. How do you approach a project? What’s your process? I always start with sketching. Many sketches. The final sketches identify the solution, including typeface considerations, color, illustrative style and final form. I often consider whether the solution can be accomplished with just type. 10. Have you ever worked on a project that didn’t turn out as expected, for better or for worse? Oh yes, I believe in allowing the process to help define the solution. And accidents are an important part of the process. Only the creator can identify when an accident, something you did not expect, adds an informative detail to the solution. 11. Are you a collector? If so, what do you collect. And why? Not a collector at all, I am a minimalist. But I do love to read and read about 50 books a year. I guess I collect books. I especially like fiction and my list of favorites is vast: Orlando by Virginia Woolf, the way she shocks the reader with the unexpected, to John Updike’s uber-realistic Rabbit series. From contemporary novelists like Jenny Egan to Flaubert’s classic, Madame Bovary. When my girls were in eighth grade, I read what they were reading and I got to fall in love again with Huckleberry Finn and Pride and Prejudice. Current favorite authors beside Egan are George Saunders, Don DeLillo, Ian McEwan, Zadie Smith and for a chuckle, David Sedaris. 13. Could you talk a little about the design process for Morla: Design. It is encased in vegan white leather with a vacuum-formed cover. What do you hope the design of your book will convey to readers? That design is not only about two dimensional space, that form can surprise and generate curiosity. I relish experimenting with materials; the vacuum-formed and debossed covers both are seductive and amplify the pattern cover art. 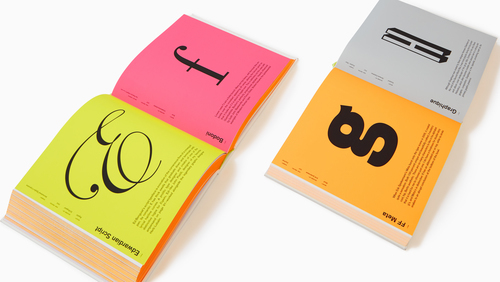 Fluorescent inks act as chapter dividers and bring attention to the section of the book I dedicated to my best loved typefaces and characters. I utilized many of my favorite printing and binding techniques in designing the book: Fluorescent and metallic inks are used to identify my essays, vellum sheets with white ink display my “designisms”, full bleed images throughout showcase projects and the ribbon markers allow the reader to mark favorite images. 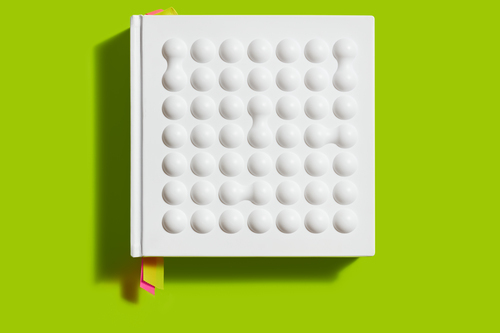 The book itself is a tactile and visually rich object. 14. In addition to running Morla Design, you teach at California College of the Arts. What are some of the most common questions you receive from students about making a living as a designer? I believe that a good designer is a great listener, and if you carefully, the client nearly always gives you the solution to the problem.